Most of planets in our solar system have been discovered many years ago. In the paper, the irregularity of distance and also angular velocity for planet of Jupiter is shown. In the orbit gap between Mars and Jupiter there exist a belt of steroids now. Based on the paper, by calculating and comparing especially angular velocities, we will consider the possibility of existence of the other planets in the ancient time. 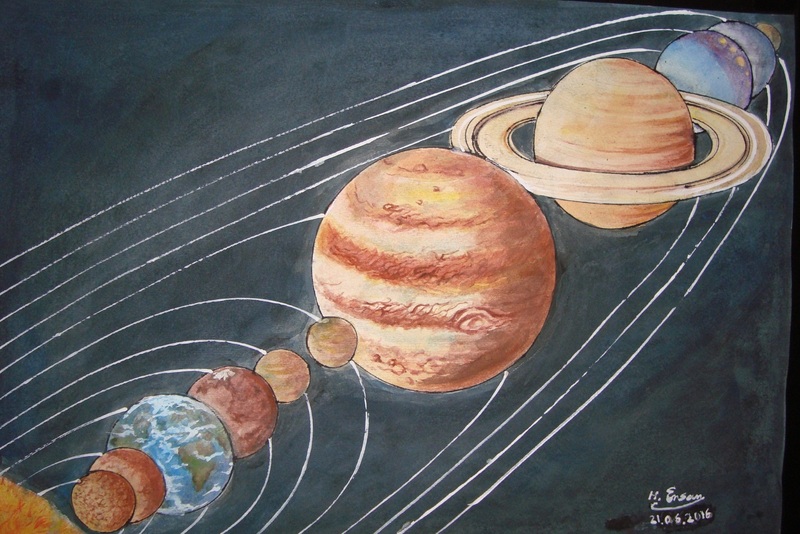 In the painted figure by author Ensan, the two planets between Mars and Jupiter supposed to be the missing planets mentioned in the paper in our solar system in the past time. Their comparative sizes and also compositions are not discussed in the paper. In a recent paper by author Hadi Ensan, shows by computational approach the possibility of existence of such planets between Mars and Jupiter in the ancient era. 1. The ratio of angular velocity or rate of change of angular velocity. It is introduced by the portion that is the angular velocity of each planet divided to the before planet angular (closer to sun) velocity. 2. The ratio of distances is another physical parameter that is introduced in the paper. It is a ratio that its numerator is the distance of the planet from Sun and its denominator is the distance of the before (closer to sun) planet to Sun. “Based on two new ratios of distances, angular velocities in the paper and computing, it is suggested that between the orbits of Mars and Jupiter had existed not only one but two planets in ancient era” Ensan said. The theory of missing two planets between Mars and Jupiter is based on the rate change of distance and also angular velocity of planets to Sun in our solar system. Calculating and reviewing the planets ratios of distances and also their angular velocity from Sun shows that the ratio of the distance and also the ratio of angular velocity for Jupiter planet is an exception. We see big difference for the ratio of angular velocity for Jupiter planet and also its distance to Sun; comparing to the other planets. Based on the discussion in the paper, two planets are suggested to have been between Mars and Jupiter. In the paper their approximate distances and also their angular velocities have been calculated. Past existence of those two planets solves the irregularity of distance and angular velocity for the planet of Jupiter.